With over 16 years of experience, Sanjay Hans, Owner of Hans Licensing Co. has worked extensively with licensors and licensees across the world. A consultant in licensing, he specialises in the buying, selling and merchandising and production areas. He shares his insight about the industry. Aparna Sharon Isa Dass (ASID): Tell us something about the inception and growth of Hans Licensing Co? Sanjay Hans (SH): I started this company in the year 2004, and with time there has been an increase in the market potential in India. Initially, we first established our base in Mumbai. We had our share of hurdles but were successful in overcoming those hurdles and now we are happy to see the way the industry has grown. Today, our network has grown not only in India but also in the international markets. SH: Brand licensing is a great concept where the brand owner generates revenue through his intellectual properties by giving rights to the licensees. ASID: How important is brand licensing for a company? SH: Brand Licensing is the way to enhance one’s brand value, market strength and generate revenue. Consultants and agents in licensing business provide manufacturers and other licensees the opportunity to gain the best results. names? Is it a risk to license a brand name? SH: Undeniably it is beneficial for any brand owner to get into licensing as all licensees specialise in promoting a brand along with amassing profits for them as well as the brand owner. There is no risk involved, given that both the licensor and the licensee find the right associate. Using the services of consultants and agents would help them in identifying the right partners to avoid any future disputes. ASID: Being in the trade since 16 years, could you name your major clientele? SH: We have worked with Globus and Pyramid in India to name a few. Internationally we have worked with Intercontinental USA, Bradford in USA, Sun RNP in Japan, Hip Design in UK and Bam Brands in Australia and many more. ASID: How receptive are the Indian retailers to licensing? SH: Every individual has his/her own set of thoughts, which may differ according to the context. Some may be open to licensing while some may be not. However, looking at the positive aspect of licensing is what we would do. Licensing has to take centre-stage in organised retail and once done in a right manner, there is no looking back. ASID: Are the Indian retailers and market ready to set forth its foot into the brand licensing arena? Which all industries can be a part of licensing? SH: I would still say it is at a nascent stage, the potential is huge though. The industries could be as many as one might imagine, from clothing to electronics, licensing can be a part of each industry. 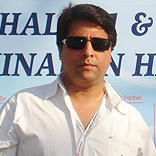 Sanjay Hans, Owner of Hans Licensing Co.